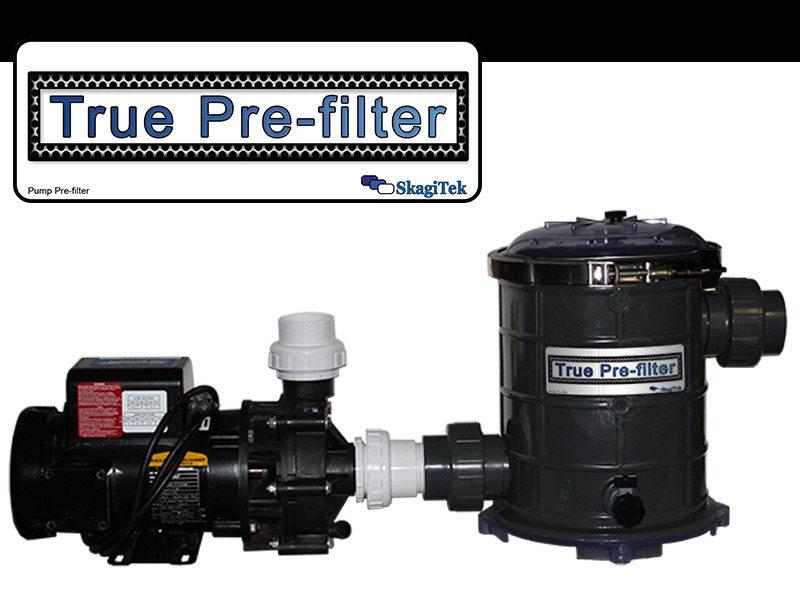 True Pre-Filter - SkagiTek Inc. 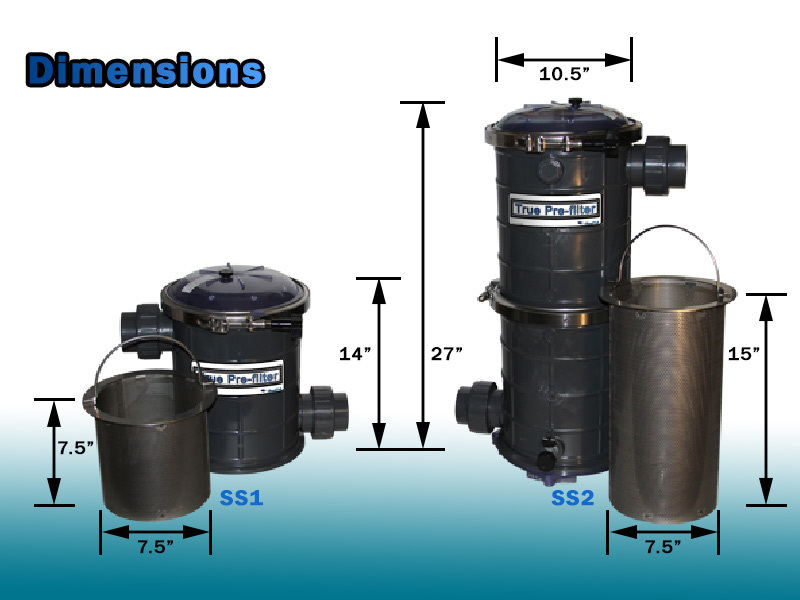 The True Pre-filter is available in two sizes to handle the job. Install in front of a pump to maximize on trapping debris and reducing maintenance on other filters while protecting the pump. The True Pre-filter is a study canister with a heavy-duty extra large capacity Stainless Steel basket inside. With this Pre-filter, you are going to be pleasantly surprised at just how much it can hold and the quality of the units. 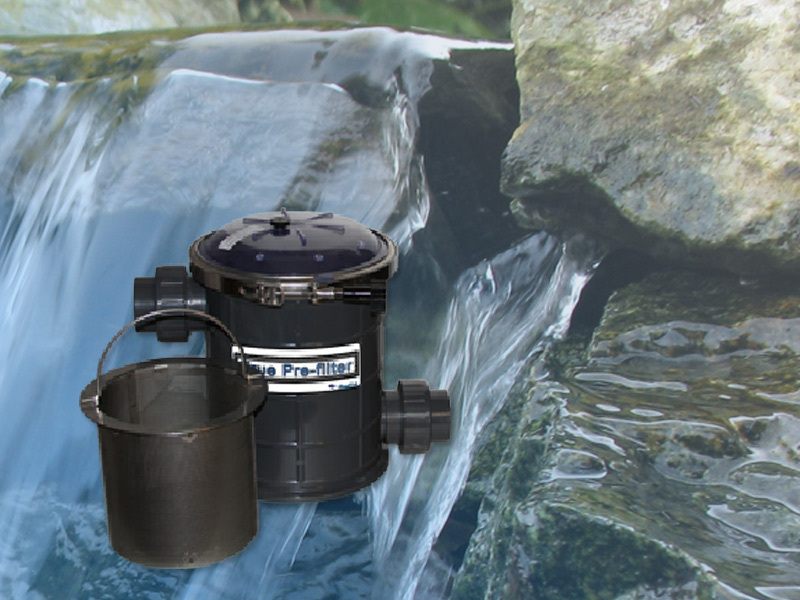 In the True Pre-filter, the water enters from above the basket enabling even more capacity over conventional designs that has the water enter from the side. 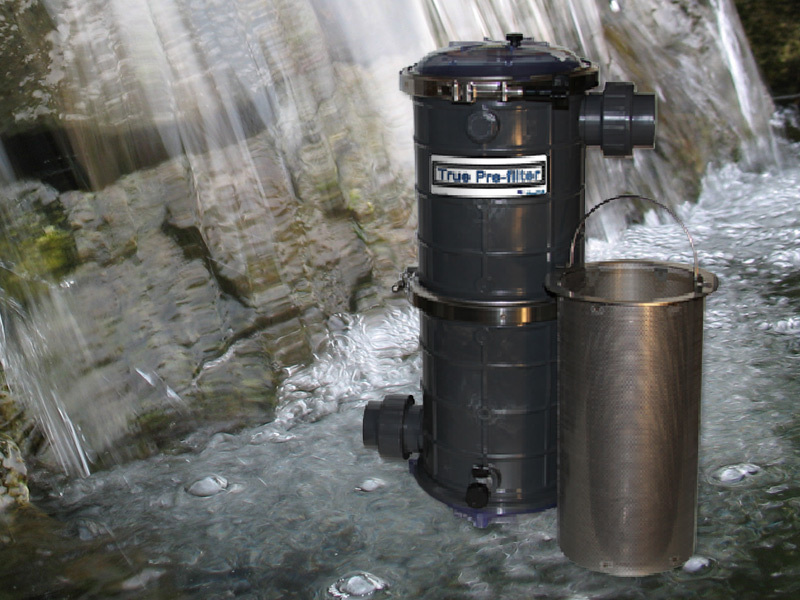 Keep your flow rates up and your filters clogging less with a True Pre-filter. Food for thought, if a 3 inch pipe holds 4 times the volume of a 2 inch pipe, then wonder just how much a 7.5 inch inside diameter Stainless Steel basket can hold over the other plastic baskets on the market that have 4.5 inches at the top with a 3 inch wide bottom. 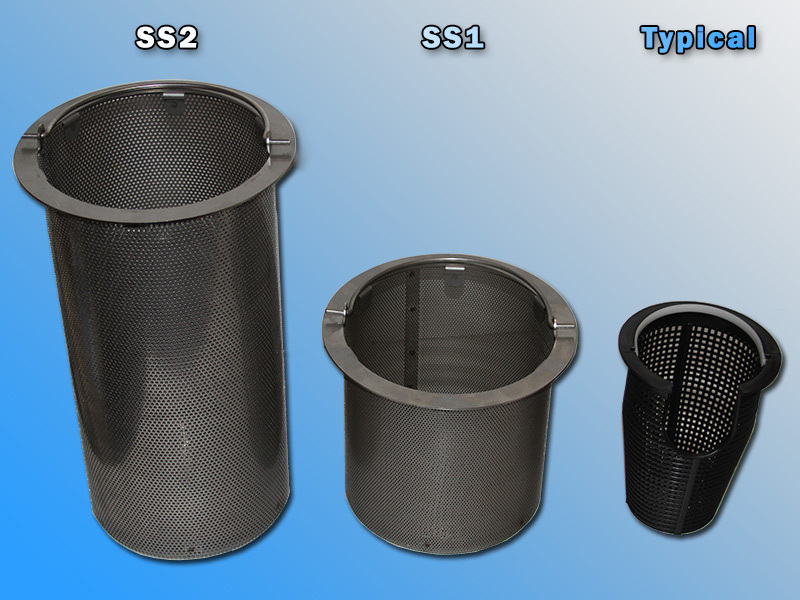 The True Pre-filter Stainless Steel basket holes are 5/64 inch small and round in shape as compared to the plastic baskets of other brands which are at least a square 1/8 inch or larger, thus permitting larger debris through and forcing you to backwash your filters more often. Many of the other baskets are closer to 1/4" x 3/8" openings which do permit small rocks that damage the pumps internal parts. 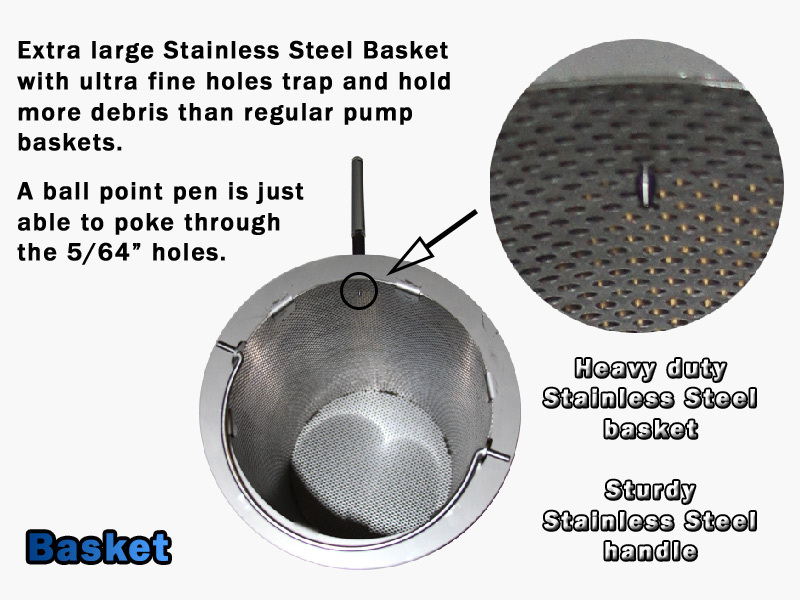 The solid stainless steel basket with its sturdy handle is sure to impress any professional or serious customer setting up their pond equipment. Many have called back after installing the True Pre-filter, very excited about the quality and sturdiness. The need for this design came about from a great number of customers needing to replace their broken plastic baskets, which get weaker and crack after a short time. The gray body is a sturdy and thick-like schedule 80 PVC material for a very strong canister. The canister has a sealed clear dome lid making this a pressurized system benefiting the priming of pumps because of its capacity to hold water even if your pump is not a self priming pump. The 2 inch unions are custom made and very strong. With a union on each port, it makes for ease of removal for those in colder climates that prefer to bring in equipment during the harsh winters. A small ball valve is located on the lower side for draining if needed. A cap is installed over it to protect the threads that also permit attaching a garden hose. The clear dome lid makes it easy to see when to service. What a great solution for trapping our pond crud before the intake to our pump! The True Pre-filter turned out to be the ideal solution needed for our commercial project. As a pond builder, we needed a good pump pre-filter for our largest pond client's equipment. 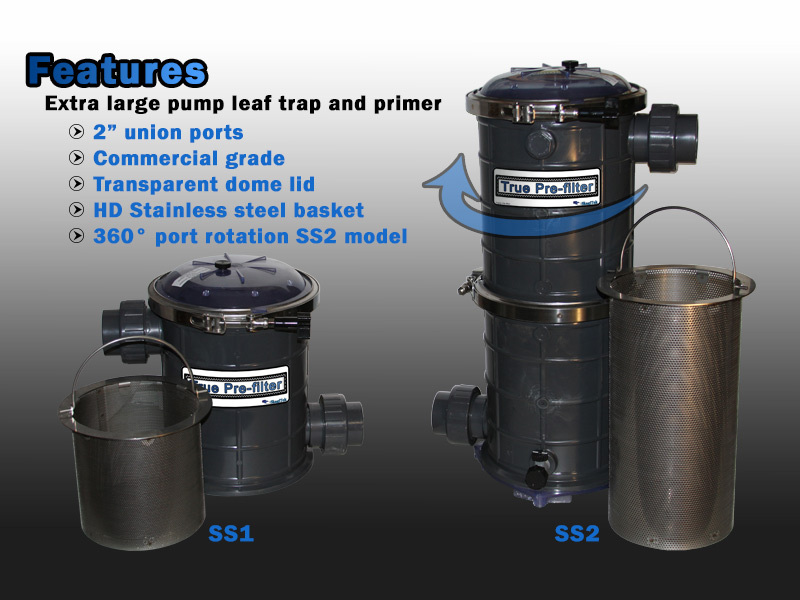 After seeing how well the two SS2 True Pre-filters where built, we over-nighted 6 more units to the job.